Teeth whitening and bleaching procedures are driving growth in the American dental hygiene market. Teeth whitening alone is a $11 billion business. However, all is not well within this lucrative sector. Battle lines between nondentists and dentists, first drawn in 2005, grow deeper by the day. Nondentist teeth whiteners contend that this is a classic case of institutional suppression of entrepreneurial liberty under the garb of protecting public health. 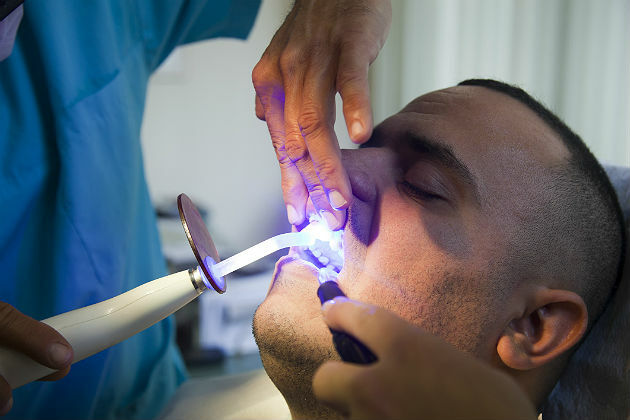 They say the American Dental Association (ADA) and the various state dental boards are contriving to appropriate the booming market for themselves, by passing legislation that deem teeth whitening to be a dental procedure. For its part, the ADA maintains that its concerns are legitimate and teeth whitening treatment when carried out by nonprofessionals can lead to irreversible tooth and gum damage. Teeth whitening procedures performed in nondental settings such as kiosks, spas and salons use chewing gums and rinses that contain bleaches such as carbamide peroxide and hydrogen peroxide. The procedures can cost $100 or more, but the same procedures carried out by dentists attract charges upward of $350. Across the country, 38 states have either proposed or already placed restrictions that allow only licensed dentists, hygienists and dental assistants to provide this service. The list of states includes Georgia, Alabama, North Carolina, West Virginia, Iowa, Washington D.C, Nevada, Tennessee, Oklahoma, Louisiana, New Mexico and Connecticut. States that allow nondentists to sell teeth whitening equipment and kits online and in bricks and mortar stores include California, Florida, New York, Ohio, Pennsylvania and Texas. When the U.S Supreme Court comes back in session Oct. 6, it will hear a case — North Carolina Board of Dental Examiners v. FTC — that will assuredly have far-reaching implications on how the issue shapes up. In 2010, the Federal Trade Commission (FTC) ruled that North Carolina's Board of Dental Examiners, by issuing cease-and-desist letters to 42 teeth whitening providers and discouraging mall owners, had acted in an improper manner with the intention to harm competition. The state board's decision to not seek court intervention and unilaterally issue orders to nondentists led the FTC to term its actions as "an anticompetitive conspiracy." "The fact that the board is comprised of private dentists elected by other private dentists, along with North Carolina's lack of active supervision of the board's activities, leaves us [the court] with little confidence that the state itself, rather than a private consortium of dentists, chose to regulate dental health in this manner at the expense of robust competition for teeth whitening services. Accordingly, the board's actions are those of a private actor and are not immune from the antitrust laws under the state action doctrine." The Supreme Court's ruling may well usher sweeping changes with respect to state licensing laws, antitrust immunity for interest groups, and the power that private licensing bodies enjoy. At the same time, the court will also have to take into cognizance public health and safety issues. If teeth whitening is moved out of the purview of dental practices, it could set a precedent for other cosmetic procedures.